• open the doors, thus endangering other people or road users. • get out and disrupt traffic. • operate the vehicle's equipment. Additionally, children could set the vehicle in motion if, for example, they: • release the parking brake. • shift the automatic transmission out of parking position P.
• shift the manual transmission into neutral. There is a risk of an accident and injury. 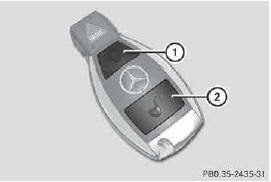 When leaving the vehicle, always take the SmartKey with you and lock the vehicle. Never leave children or animals unattended in the vehicle. Always keep the SmartKey out of reach of children. When unlocking, the turn signals flash once. When locking, they flash three times.